Chicago, Illinois - West Virginia teachers took the story of their successful statewide strike to three thousand union activists attending the biannual Labor Notes conference. Labor Notes is an organization of rank and file union activists working to revitalize the labor movement. Kanawha County teacher Olivia Morris spoke at a workshop about the West Virginia strike. 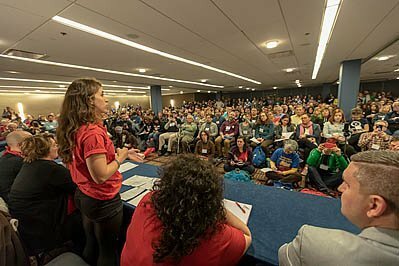 Image Description: Chicago, Illinois - West Virginia teachers took the story of their successful statewide strike to three thousand union activists attending the biannual Labor Notes conference. Labor Notes is an organization of rank and file union activists working to revitalize the labor movement. Kanawha County teacher Olivia Morris spoke at a workshop about the West Virginia strike.